Saturday Feb 6, 2010 was my day off. However, a person wanted a meeting. So, I was flexible and took the time to meet the 3 young vets and had an interesting discussion with them and at the same time educate myself regarding the veterinary industry and trends. 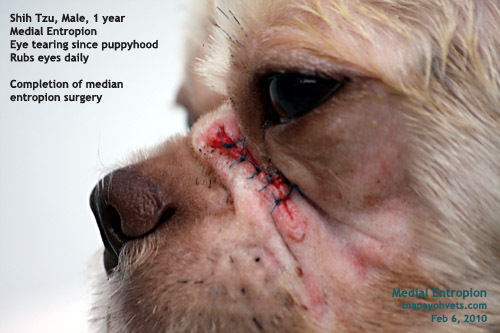 One of the problems of young vets is the prospective clients' remark: "You look so young...can you perform the surgery (e.g. 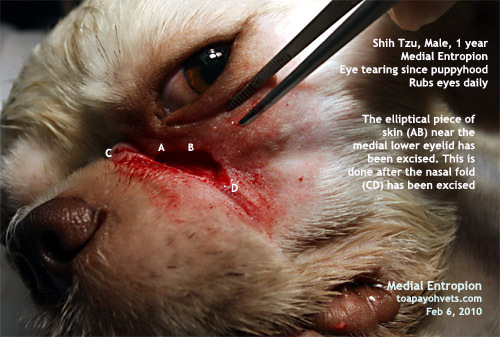 repair the bite wounds)?" Well, this is a common remark and applies even to medical surgeons. Last year, I was at the Singapore General Hospital for an operation to be done by an experienced surgeon in his late 50s and an old friend. All prospective patients will be impressed and comforted by the appearance of his grey hairs when they consult him at Clinic J. 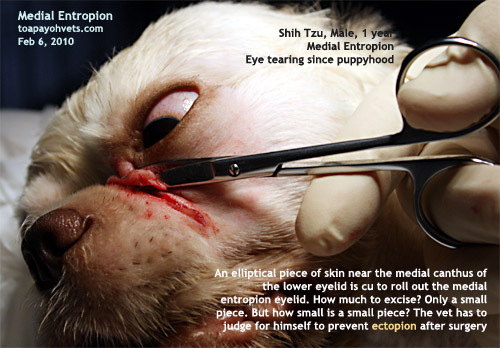 They testify to his abundant surgical experience over the years. 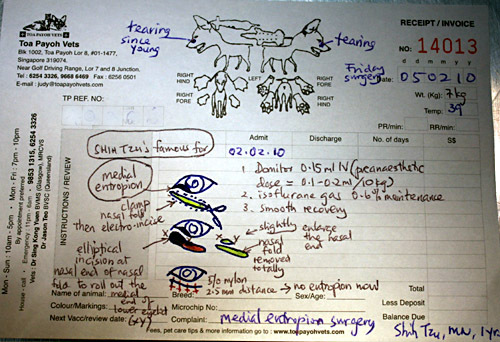 His surgical assistant, a young surgeon known as "The Registrar" attended to me in the administrative matters. I asked her how's her posting as we walked to another section to make the booking and she said to me: "Singaporeans look at me and query whether I am capable of doing their operation." I was not surprised at her comments as Singaporeans say the same thing to newly minted veterinary surgeons too. How should one reply to such queries? 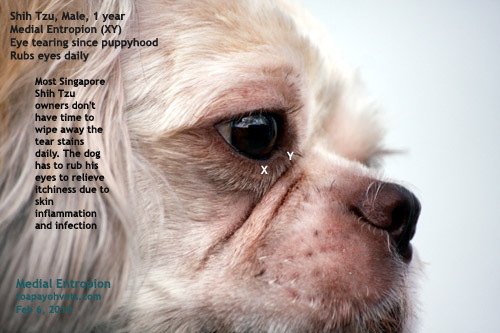 It will be difficult unless one is a show man and produce testimonials. 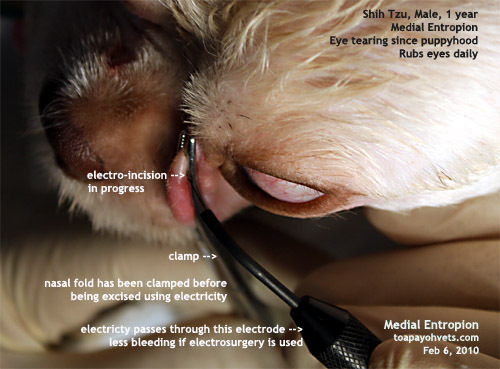 The business of surgery is serious and is not a theatre. I guess, the young ones who don't have senior vets in the practice have to take such remarks in their stride and assure the prospective client that his dog is in good hands. "Such remarks are made about the young vets in established vet practices in Singapore," I told the 3 young vets. "All vets will have to go through such challenging remarks." 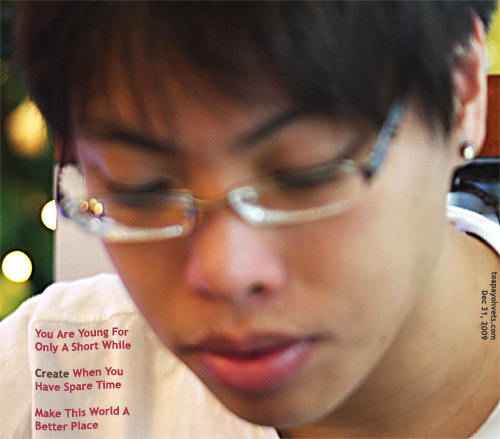 Other than real people in this real world, is there another invisible world supervising us? 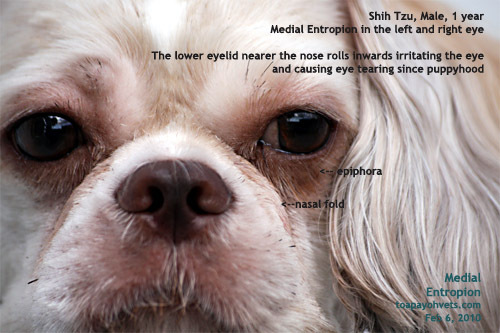 I ask this question because I was looking for an old Shih Tzu who had medial entropion. 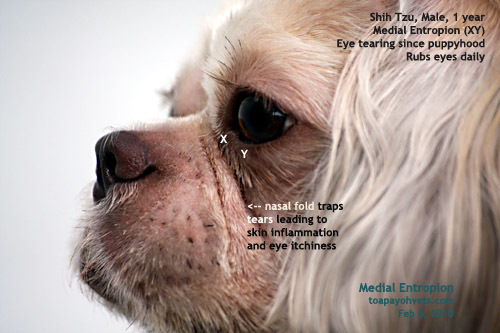 A 1-year-old Shih Tzu had come in 3 days ago for medial entropion surgery (pictures below). 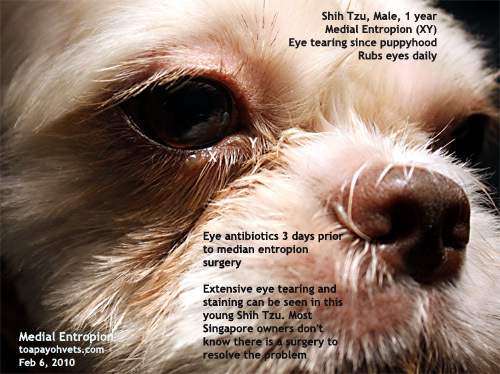 Next day, a 10-year-old Shih Tzu with bloodshot eyes came in for treatment. 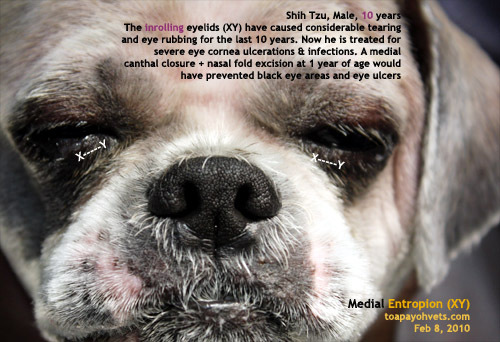 He had corneal ulcers, acute conjunctivitis and black pigmentation in both eyelids. 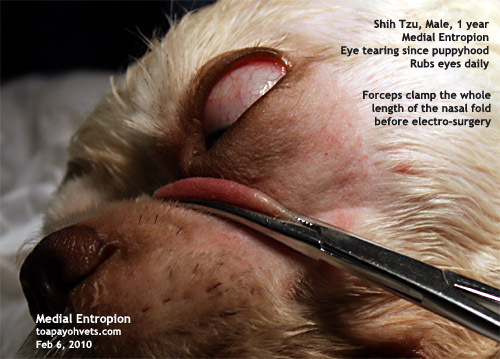 His left eye was filled with sticky pus. 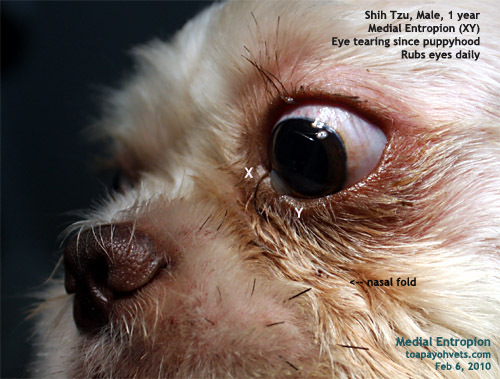 This 10-year-old Shih Tzu was my answer to "what happens if there was no medial entropion surgery done for the Shih Tzu?" Well, you can call it a coincidence. 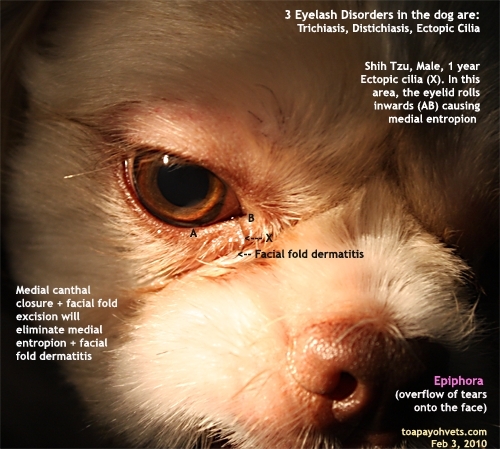 I have had 3 Shih Tzus with corneal ulcerations in the last 7 days and one of them was this 10-year-old Shih Tzu. 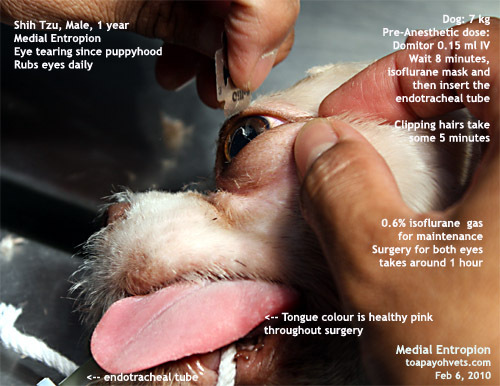 "All these eye infections can be avoided if the dog had an operation to roll out the inward rolling eyelid near the nose when he was a young puppy," I remarked. 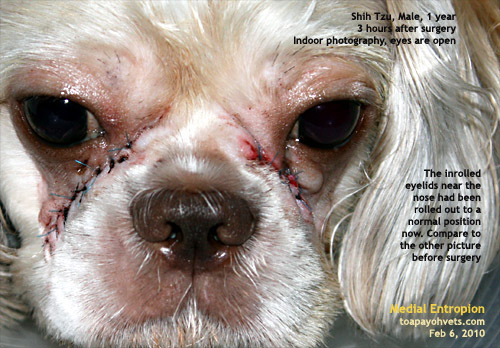 "I don't know there is such a surgery," the lady owner told me patiently. She was worried about veterinary expenses. 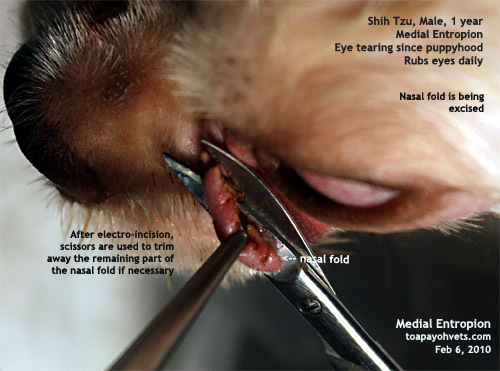 This surgery, known as medial canthal closure is seldom mentioned by vets in any case. 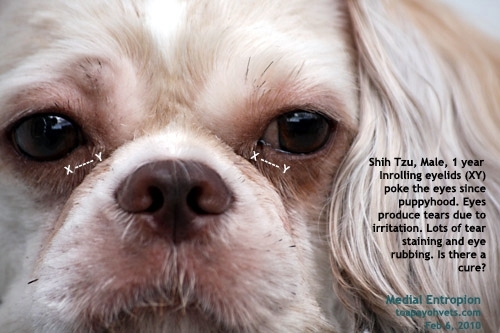 The following pictures of the 1-year-old Shih Tzu illustrates the surgery.